I couldn’t help but feel more than a little trepidation at the announcement of a new Lego game for the iOS, particularly after the huge disappointment that was Lego: Batman. Still, two years is a long time in development land, and of late we’ve seen developers make leaps and bounds in what can be squeezed from the Apple devices. Fortunately, the Warner Bros. 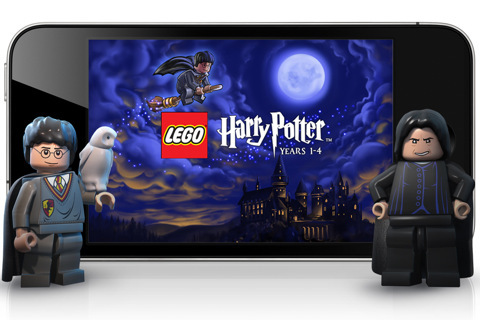 Mobile dev team haven’t rested on their laurels in all this time, having really stepped up to make amends with the release of Lego Harry Potter: Years 1-4 [$4.99], a universal app for the iPhone and iPad. 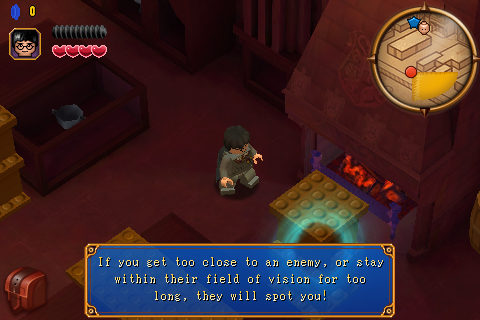 Lego Harry Potter: Years 1-4 is in actual fact a port of the PSP and DS version of the game released earlier this year. Though I haven’t had the opportunity to play either, from screenshot comparisons you can immediately tell that the game has– contrary to many ports– benefited dramatically from its translation to the more capable iPhone and iPad hardware. This is no lazy carbon-copy, good readers– graphics look crisp and vibrant (particularly on the Retina display, but even so on the 3GS we primarily tested it on) and the frame rate is consistently good; controls have been tastefully re-modelled for the iOS with mini-games that make great use of the touch-screen; and the musical score is authentic and second-to-none. In fact, I am certain that what we have is now the premier handheld version. 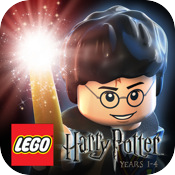 But first thing’s first – for the benefit of those who have never seen a Lego game in action (other than getting you from out of your cave), Lego Harry Potter: Years 1-4 is a re-imagination of J.K. Rowling’s ludicrously popular fiction in all the childlike splendor of Lego. 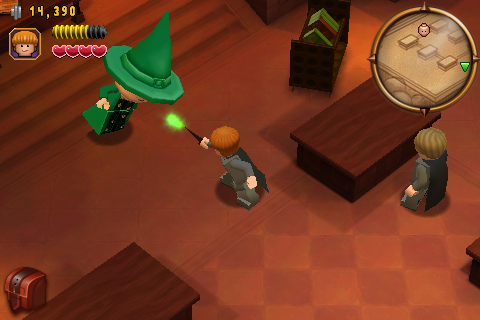 Everything in the game is made up of Lego pieces, from the well-known heroes such as Harry, Ron and Hermoine, to table decorations, quidditch broomsticks and even the different colored coins littered positively everywhere that act as a form of currency in the game. And in true Lego style, the entire world is over-the-top. Cut-scenes between levels tell the Harry Potter story in an exaggerated, tongue-in-cheek way that can be more than a little hilarious at times, especially as Lego men can’t talk (of course)– having to mime out and gesture through all their conversations. 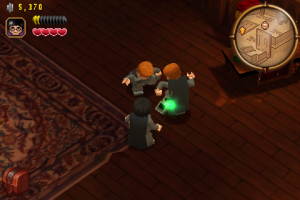 In fact, I was pleased to see that these clips are actually the same as those in the PS3/X360 version of the game (which I have played) which re-tell each of the first four chapters (Philosopher’s/Sorcerer’s Stone, Chamber of Secrets, Prisoner of Azkaban and the Goblet of Fire) brilliantly. That’s a word I constantly came back to when playing Lego Harry Potter: Years 1-4, as there is just so much to explore and such a variety of rich experiences to play through that more than once I forgot I had an iPhone in my hands. Whether it was taking magic classes in the enormous Hogwarts, visiting stores at Diagon Alley, or chasing after Draco on a broomstick as he he makes off with Neville’s Remembrall, Lego Harry Potter: Years 1-4 is jam-packed with memorable events that have been craftily converted into engaging gameplay sequences. You start off controlling Harry, moving him around the screen by either tapping or dragging your finger across the screen. There’s no virtual joystick option here which may disappoint some, but I can’t really say I had difficulty migrating to the new controls. Spell casting has also been carefully implemented for the touch screen. Very early on, you learn the Reducto spell which is a simple hooting spell that requires a quick flick towards the object you want to hit (which I resort to spamming to explode anything in sight to coin pieces), and Stupefy, which is an area stun attack that requires a quick circular gesture around your character. 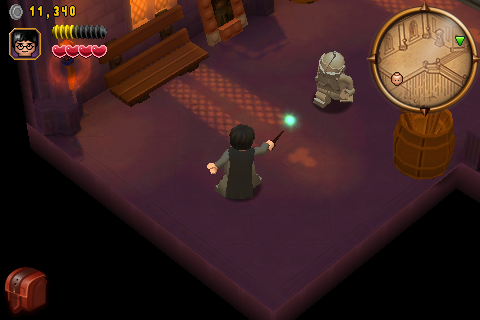 Soon you’ll accumulate a wealth of spells as you take classes at Hogwarts and explore the game world. Reparo for instance is needed to piece together important objects, whilst Wingardium Leviosa is used to levitate objects and reach otherwise inaccessible areas. These spells are performed by tracing on-screen gestures that appear after tapping a context-sensitive object in the game world. Other spells still, such as Transfiguration, result in short mini-games that have to be completed before they take effect, most of which are actually engaging and not merely annoying distractions. 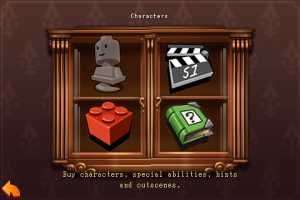 If you’ve played a Lego title before on any other system, you’ll be glad to know that all the unlockable characters and abilities normally expected of these games feature here too. 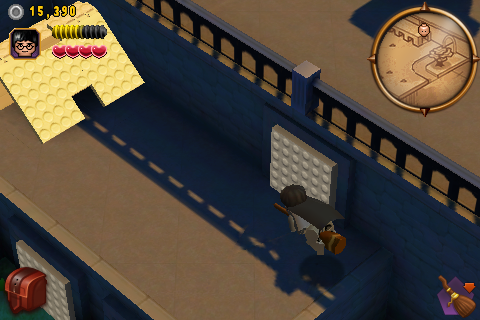 In each of the 40+ levels in Lego Harry Potter: Years 1-4, you’ll usually take control of just a few of 100 characters available, some of which have special abilities that have to be utilised to progress through the level. Hagrid, for instance, can use his strength to interact with pulley mechanisms and pull and push heavy objects that the others cannot. Exploring each area thoroughly and working through some clever puzzles will reveal red bricks, golden witches hats and character cards that make available additional spells (of the ridiculously variety, such as Engorgio Skullus, which can swell any NPC’s head to giant proportions) and unlock playable characters. To go through every facet of Lego Harry Potter: Years 1-4 would be nigh on impossible in a review. Case in point– just as I thought I’d seen much of what the game had to offer, I was thrown into a stealth sequence, where you have to rely on your map to avoid detection. Later still, I had my first real boss encounter, which requires a lot more dexterity and thinking than the usual puzzles. Suffice to say, this is one game that will put your money to work in a big way, as it is seriously bursting at the seams with content. If I had to put my finger on the average play time, judging by my current game, you’re looking at somewhere between 12-15 hours over all four chapters. Then there’s Free Play mode, where completionists can access all the levels of Story Mode to find hidden secrets (using later acquired abilities) and drastically explode their game time. Lego Harry Potter: Years 1-4 is without a doubt a must-buy for any real iOS gamer, barring any prejudices you may have against our scar-faced hero, of course. This is the game to show your doubting friends as I don’t believe a game of this depth or breadth presently exists on the App Store, and certainly not one with the care and attention that the Warner Bros. team have expended on it. Yes, it does benefit from being a port of an existing game on a more developed system, but when the quality of the finished product is this good, who really cares? I simply cannot overstate just how high the bar has been raised for these types of games– a shout out to other developers with similar opportunities to take note of what our beloved Apple devices are really capable of. iPad Owners: Please note that although the game is listed as Universal and can be purchased without any problems, the game will not be able to be synched to iPad devices until the release of OS 4.2 (purportedly next week). You must have the new OS 4.2 update before the game can be played on the iPad.